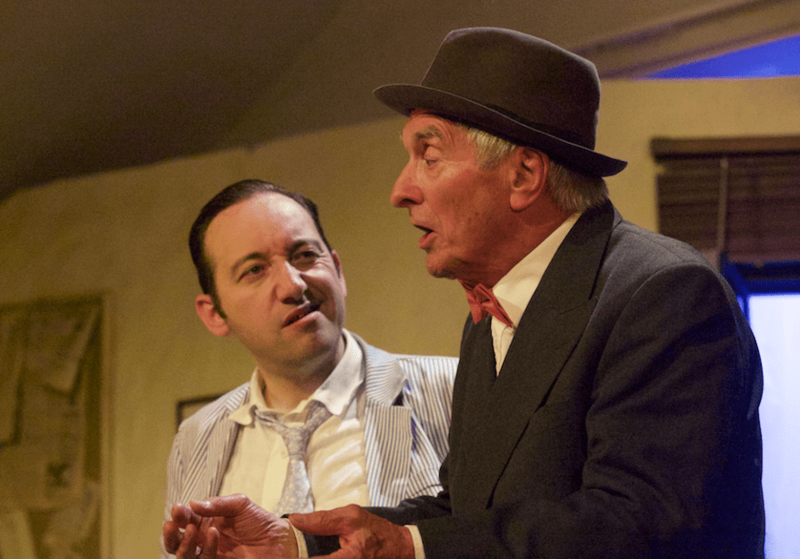 A play with a cast of 20 is enough of a test for any production team and the fast-moving dialogue and action in this 1928 comedy by two former Chicago newspaper reporters adds to the challenge. It’s also a lengthy play, just 15 minutes short of three hours, performed in three acts in one set. Edinburgh Theatre Arts keep the pace going from the off with a group of newspaper hacks whiling away the hours playing cards as they await the execution of cop killer Earl Williams. The run-down courthouse press room has been expertly recreated in the tight confines of a church hall, including the essential rolltop desk, constructed by Malcolm Doull, and which acts as Williams’ hiding place. Occupying this smokey, drink-fuelled den are the cynical newspaper characters of the inter-war years, playing fast and loose with their stories and their subject matter with only the next day’s headlines to care about. Central to the plot are the two principals, the ace reporter Hildy Johnson and his editor Walter Burns who battle over Johnson’s decision to quit the business and join an advertising agency, leaving the windy city for New York with his bride-to-be Peggy. Except Burns has other ideas about losing his top man. David McCallum gives a convincing performance as the deluded Johnson, torn between love for his girl and the thrill of chasing the next big story. David Gibson as Burns has some of the best lines which needed greater expression, even exaggeration. Burns is a larger-than-life character, a self-assured, arrogant and disdainful employer who’ll get what he wants at any price. Too often Gibson has him timidly conversing with his fellow actors when he may have had more impact at front of stage bellowing his cocky and comedic asides to the audience. 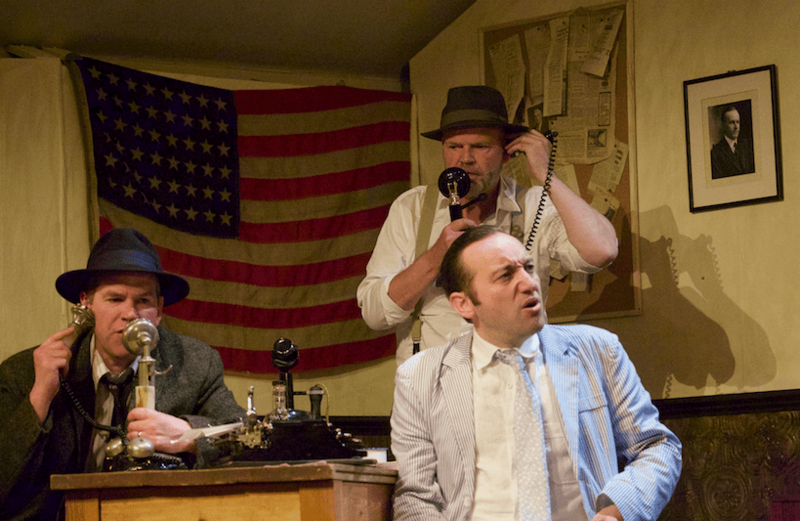 Apart from that slight niggle, the cast superbly deliver the quickfire, wise-cracking dialogue that captures the hustle of a tense situation, and the backroom team should be applauded for the lighting, stage direction and attention to period detail. The play is a little darker than some of the film versions, notably Billy Wilder’s 1974 movie starring Jack Lemmon and Walter Matthau, and here there is a well-enacted sense of fear and alarm when Williams breaks out of his cell to the sound of gunfire. Among the stand-out players are Colin McPherson as the hapless Sheriff Hartman, Suzie Marshall, giving an emotional performance as the street girl Molly Malloy, and Felix McLaughlin with a professional-standard interpretation of reporter Murphy. The Front Page is a gem of a story from an industry much changed, but the underlying themes of self-seeking rivalries, mutual suspicion and distrust never change. The play is a tough nut to crack and Edinburgh Theatre Arts should be commended for this production. Go see it while you can.